The former Burgess Hill Town and Worthing centre-back missed virtually the whole of last season with major liagment damage and has found football limited this season. 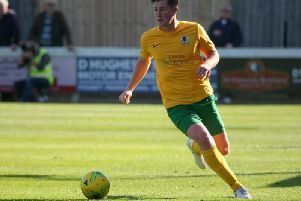 The 23-year-old was a member of the Hillians academy before breaking into the senior side and won a Bostik League South Division championship medal in his first season before going on to captain the side. Having missed the majority of the 2017/18 campaign through injury, Miles made a switch to Worthing last summer. He was, however, released by the club last month and has been snapped up by Hornets manager Dominic Di Paola.